To Cite: Ghafori S, khavanin A, Assilean H, Solimanian A. Assessing the Application of the Flexible Joint in the Exhaust Pipe and Braided Wire Damper in Muffler on the Sound Emitted by the CG125 Motorcycle Exhaust, Health Scope. 2016 ; 5(3):e24154. doi: 10.17795/jhealthscope-24154. Background: In recent years, noise pollution has become a serious problem for residents in urban areas. Motorcycles have an important role in producing noise. Objectives: This study aimed to reduce motorcycle noise by using flexible joint in tailpipe and braided wire dumpers at its exhaust. Materials and Methods: In this study, SAE J1287 procedure was used for noise measurement of Amico CG125 motorcycle. Also, for measuring the temperature and pressure of exhausted gas, JIS B 8006 and JIS B 8007 methods were used, respectively. The instruments used for measuring noise, temperature, and pressure of exhausted gas were CEL-6X0 sound level meter, detector of exhaust gas analyzer, Pitot tube, and incline manometer, respectively. Flexible joint and braided wire damper were also prepared (Erteash Gostar Peyman Company). Results: By using this new exhaust at speed levels of 1000, 2000, 3000, 4000, and 5000 rpm, we had respectively 3.9, 6.8, 7.4, 5.6, and 5 dBA decreases in total sound level pressure. Conclusions: Use of flexible joint in the exhaust system leads to conversion of linear vibration to non-linear one, resulting in significant reduction of noise levels. Noise pollution or noise disturbance refers to excessive or annoying noise. The sources of most outdoor noise is mainly machines, transportation systems, motor vehicles, aircraft, and trains (1, 2). The noise pollution has expanded over the different aspects of human life and even animals via its adverse effects. Noise, like other kinds of environmental pollution has adverse effects on human health. However, noise pollution compared with other kinds of pollution such as water and air pollution has drawn less attention, because the air and water pollution have more contamination and far more harmful effects on life in general. However, around 20% of the European Union’s population or, close to 80 million people, suffer from noise levels that are considered unacceptable meaning that many or most people become annoyed, their sleep get disturbed, and serious long-term health effects can be expected. The European Union calls this condition Black areas. An additional 170 million citizens are living in so-called grey areas these are areas where the noise levels are high enough to cause serious annoyance during the daytime but no one seriously affected by environmental noise. These are mostly rural or privileged places in urban areas (3). The noise pollution has become a major problem in city population areas. A study of human subjects exposed to airport noise overnight in their home showed endothelial dysfunction, which was attenuated by administration of the antioxidant vitamin C (4). The vehicles as a primary source of unwanted noise had received much attention recently (5). Noise of vehicles is mainly composed of 3 parts: combustion noise; mechanical noise, like the sound of vehicle wheels; and exhaust noise through the open end of the intake and exhaust systems. To reduce exhaust noise, mufflers are usually installed near the open end of the inlet and outlet of the exhaust system (6). The body’s initial startle response to noise is activation of the sympathetic (fight or flight) nervous system, similar to the body preparations just before waking in the morning. Although blood pressure normally drops during sleep, people experiencing sleep fragmentation due to noise have difficulty in achieving a nadir for any length of time because their blood pressure and heart rate rise with noise transients (7). A significant source of the environmental noise is traffic in urban areas. Motorcycles have a considerable role in aggravating this environmental pollution. Two-wheeled or three-wheeled motor vehicles are called motorcycle, and depending on their use, can be different. In this study, we wanted to control the noise of (Amico, CG125) a motorcycle that assembled at our country, Iran. The reason of our selection is its abundant production in Iran. A motorcycle with a combustion engine is a 4-stroke, in which spark plugs ignite the mixture of fuel and air in the engine and produce propulsion power. The mechanism of action in engine causes vibration and noise during operation (8). Efforts to control emissions of exhaust noise are more centered on the use of reflective muffler and less attention has been paid to tailpipe exhaust systems to lower the sound pressure level. In this study, by using the flexible joints, we attempted to reduce noise levels emitted from the exhaust. Mechanism of action is damping the vibrations generated by the engine and prevention of its transmission to muffler. The sound pressure level measurement method is called SAE J 1287 “measurement of exhaust sound levels of stationary motorcycles” issued by America's national standards. The sound level meter should be Type 1. For sound measurement, we used CEL-6X0 sound level meter model (Casella Company). Also for calibration, C-110/1 model from the same company was used. The calibration must be accurate within ± 0.5 dB (9). Surface area of the measurement site should be flat and hard such as asphalt or concrete. The height of sound level meter should be above the ground, at the same level of exhaust, and the exhaust must be at least 20 cm above the ground surface. 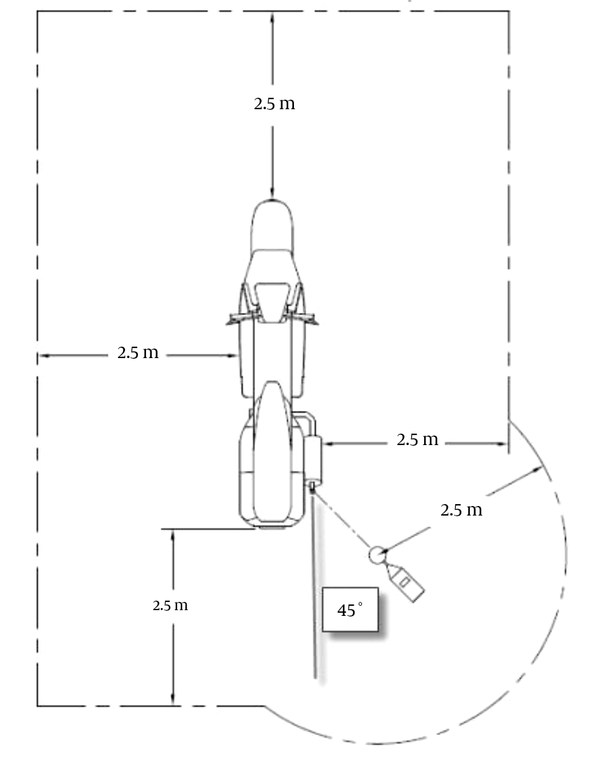 Longitudinal distance from the exhaust to the microphone is 50 cm with an angle of 45 degrees to the direction of the motorcycle. Equivalent sound pressure levels at 5 different engine speeds; 1000, 2000, 3000, 4000, and 5000 rpm were measured. To measure the speed of engine, we used the engine tachometer of motorcycles (Figure 3). Sound pressure levels at 5 different speeds with normal motorcycle exhaust systems and our designed intervention were measured. Before carrying out the measurement of sound pressure levels, the background noise level was measured based on ISO 11820 standard. First, response measurements were performed in fast response mode, line network, and at 1/3 octave band. The sound of the engine at 5 speeds was measured 3 times in each speed. Then, the average of measurements was recorded after the impact of the background noise standards. 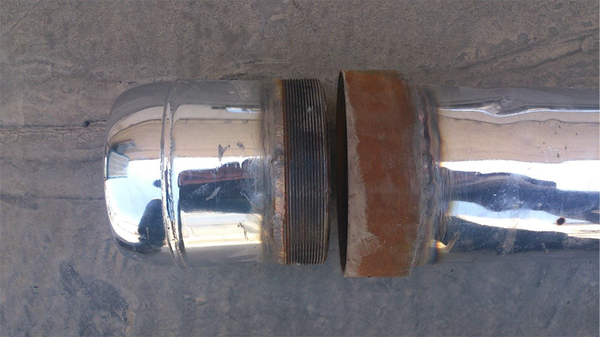 In the intervention mode, 500 mm of tailpipe from the junction with muffler was cut and a flexible joint with the same diameter (that we ordered to Erteash Gostar Peyman Company) was used instead. A temporary connection was used to connect the muffler. Figure 2 shows an image of tailpipe flexible design. Regarding braided wire dumpers in the inlet of muffler tube, we used 2 pieces of 40-cm long and 20-cm long (Figure 3). The new muffler design gives us the ability to access inside the muffler and replace braided wire dumpers on inlet tubes (Figure 4). To measure the temperature of the fluid and determine the amount of exhaust temperature, we used JIS B 8007 A (Temperature measurement of performance for reciprocation internal combustion engines). The aim of this measurement was to find the amount of fluid temperature in exhaust (10) (Figure 5). To measure the fluid pressure outputs from the engine, we used Pitot tube and solved manometer to calculate pressure lose. Engine noise measurement in factory model was done according to manufacturer’s instruction (Figure 6). Now that we have a new designed of exhaust for this intervention, we repeated the sound level measurements with the new exhaust (Figure 7). To measure the fluid temperature inside the exhaust, we used a gas analyzer device; the ambient temperature was 26°C. Measurements were done through a little hole at the tailpipe and after measurement it blocked by a screw. After turning on the engine, it should work for 10 minutes to warm up. Then, measurements at 5 different speeds were done. 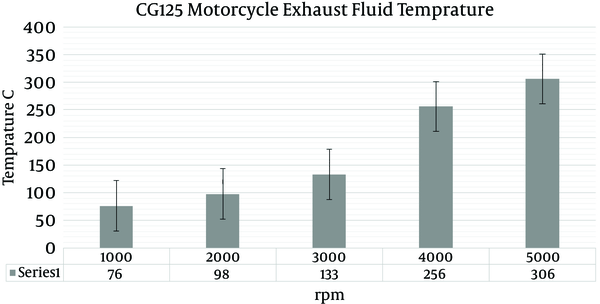 In Figure 8, CG125 motorcycle exhaust fluid temperatures are shown. The purpose of measuring the temperature of fluids was to compute the resistance of the designed part. According to the technical director of the Erteash Gostar Peyman Company, this designed part works at 600°C. As Figure 8 shows, the maximum temperature recorded was 306°C. 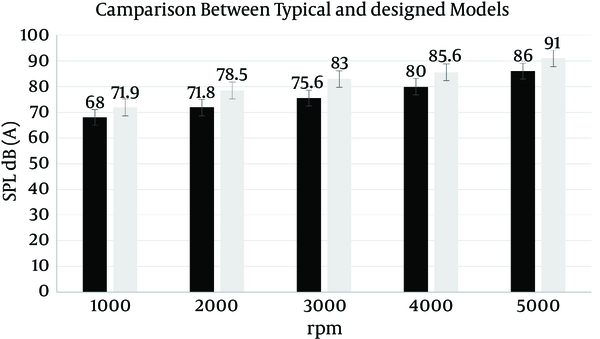 By comparing Figures 2 and 3, it is clearly seen that sound pressure levels have reduced at different engine speeds (Figures 9). To test the effect of intervention on motor performance, pressure loss before and after the muffler were measured. At the typical model, the exhaust pressure loss was 4.4 and for designed one, it was 4.6. Although we had some pressure loss but the amount is small and compared to the results of noise reduction is negligible. Therefore, the efficiency and fuel consumption of the motorcycle were not affected. Note that the internal diameter of the tailpipe in the designed one did not change and were the same in both typical and designed one (Table 1). In most studies, mufflers were used to reduce noise levels and exhaust emissions. In this regard, researchers have made notable progress that can be pointed in several studies. In 1973, G. E. Roe in a study at the University of Manchester researched on how to reduce the sound of a 750 CC motorcycle from 98 dBA to 86 dBA without reducing engine efficiency. He explained that the main source of noise are motorcycle exhaust sound, its air suction, and mechanical parts. He installed a resonator and a reflective exhaust silencer were installed for the control of suction noise (11). Dr Khavanin et al. designed a muffler for motorcycle CG125 engine and reported 17.53 dBA insertion loss at an engine speed of 3000 rpm. Pressure loss in this study was 4.1 mm H2O (12). 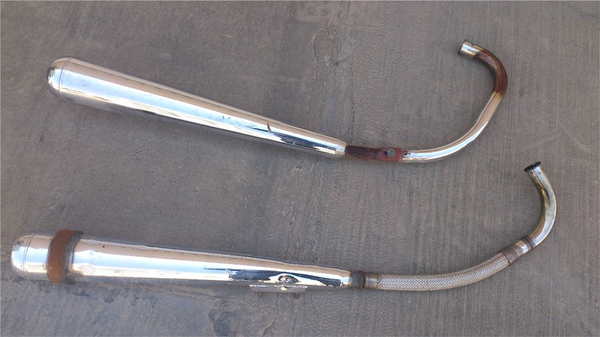 In this study, we used a flexible joint instead of a tailpipe part to reduce total sound level of motorcycle exhaust system. 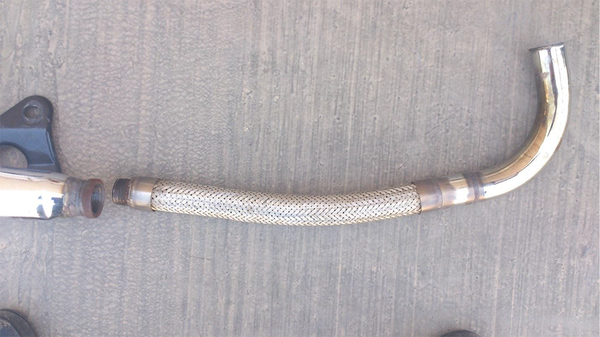 In a typical exhaust, pipes structure are integrated. The vibrations generated by the engine is transported easily to the muffler. Designed exhaust by flexible joint can dump vibrations produced by the engine. By this new exhaust, in motor speed levels of 1000, 2000, 3000, 4000, and 5000 rpm, we had respectively 3.9, 6.8, 7.4, 5.6, and 5 dBA decreases in total sound level intensity. Studies of this kind of flexible connections have been already conducted, but the amount of noise reduction was not mentioned in any of them. Some of these studies are briefly described below. John Wall et al. (2004) in their study stated that modern automobiles have a flexible connection between manifold and catalytic converters for thermal expansion and preventing the transmission of vibrations to the rest of the exhaust system. However, a flexible joint includes accordion tube and braided wires that significantly convert liner vibrations to nonlinear vibrations. However, if accordion tube is used alone, its behavior is quite linear. This means that the real systems should consider using braided wires (13). We observed that in above study only nonlinear vibrations was discussed. Engine vibrations due to nature of the work are linear. By use of this flexible joint, we controlled liner vibrations in exhaust systems. In 2009, a study conducted on isolator and truck exhaust system connection points based on modal analysis and numerical experiments. By using computer simulations and experimental data support, the researcher attempted to discriminate between two isolator performance exhaust systems with flex pipe. In this regard, flex connecter brand names in the frequency range of 0 - 200 Hz were investigated. Also, the dynamic behavior of truck exhaust systems was taken into account and measured. Finally, the best points were chosen for installation. Their main goal was to reduce heat transfer to the engine exhaust system. And they concluded that flex pipe was superior to the flex connecter with regard to more dampening the vibration in the exhaust system of the machines. As explained already, the amount of noise reduction of these flexible connections has not been mentioned in these studies (14). In conclusion, flexible joint use in tailpipe exhaust system decreased noise levels of motorcycle exhaust. In addition, we presented an exhaust system with lower weight. Furthermore, according to the technical director of the Erteash Gostar Peyman Company, the lifetime of this exhaust system is 4 - 7 years depending on operating conditions. And this period is the useful life of the motorcycle too. Although a motorcycle exhaust is inexpensive, in modern cars due to mufflers and catalysts, we should protect systems. Therefore, using flexible joints to reduce noise and vibrations is suggested. The authors acknowledge the Erteash Gostar Peyman management for their sincere cooperation, also we appreciate Senaki Chubin and all those who have cooperated in this study. 14. 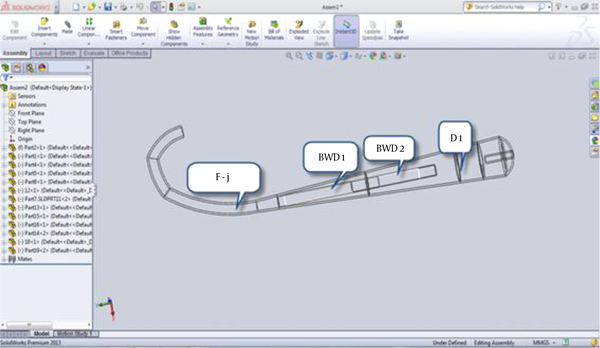 Deciding isolator and mounting points of a truck's exhaust system based on numerical and experimental modal analysis. Proceedings of the 16 th International Congress on Sound and Vibration.